The walled city of Lahore was not the haphazard jumble of closely packed houses and narrow streets as people are apt to assume, but a masterpiece of design that the city planners of today look upon with awe and respect. The city consisted of designated quarters for trades and had houses of every type from palaces to the humblest of abodes. 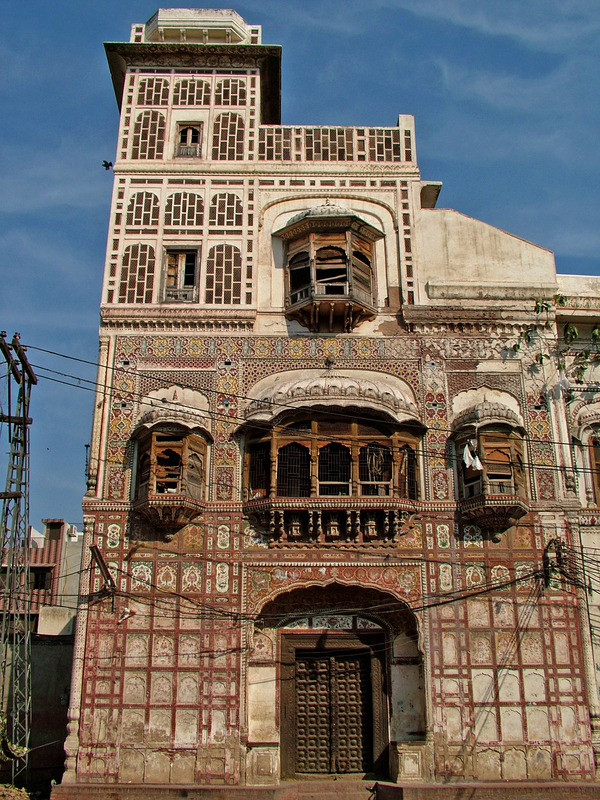 The gems in the Lahori crown, however, were the havelis – beautiful residences of the affluent class and nobility. A typical haveli consisted of a huge arched door, large enough for an elephant to get through, leading into an outer courtyard. This was surrounded by rooms, some of which served as accommodation for guests, who were not considered intimate enough to be allowed into the inner sanctum. The other rooms consisted of baithaks, living quarters for domestics and stables. Another inner arched door provided access to a dewrhi or covered passageway that led to an inner courtyard, which was paved and in many cases decorated with fountains and potted plants. Doors around the courtyard led to multi-storied tiers of spacious rooms with jharokas overlooking the area. Rooftops were expansive with barsaatis or covered verandahs where one could sleep or sit through the cool monsoon season. Large havelis consisted of more than one courtyard linked together by covered passages. Basements formed the sub ground levels and were used as storage and to escape the heat of the hot summer season. It was during the rule of the Mughal ruler Muhammad Shah that three members of noble birth Bahadur Ali, Nadir Ali, and Babur Ali began construction of a grand residence inside Mochi Gate. 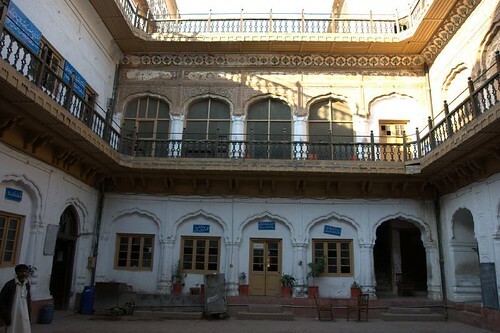 There was great joy in the family, as the structure’s completion coincided with the arrival of a male child to Bahadur Ali, giving the haveli its name – Mubarak Haveli. Many years later, the grand structure was taken over by Maharaja Ranjit Singh to serve as one of his residences and the royal guest house. The fugitive Afghan King Shah Shuja and his family were kept in this premises and forced to hand over the world famous Koh-e-Noor diamond to the great Sikh ruler. Passing through many hands, the premises was finally bought and put under a trust by a leading citizen of Lahore, who was also a descendant of the original owners. The haveli was and remains the traditional starting point of major Muharram processions, which wind their way through the city to culminate at Karbala Gamay Shah. This news was published in print paper. To access the complete paper of this day.